After the recording, a User Path using AMF streaming is displayed as follows. AMF streaming requests are identified as having a name with the <path> open and <path> close formats. The open Push request (/samples/messagebroker/streamingamf open for example) has been placed in a secondary execution thread, push_fork. 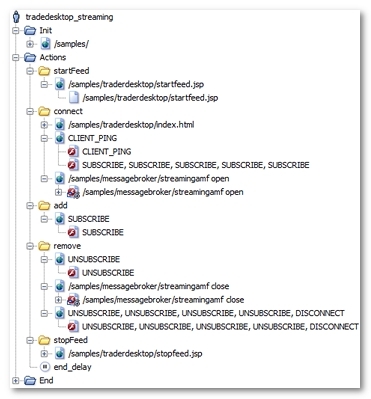 NeoLoad identifies the different types of message returned through the Push channel during recording. 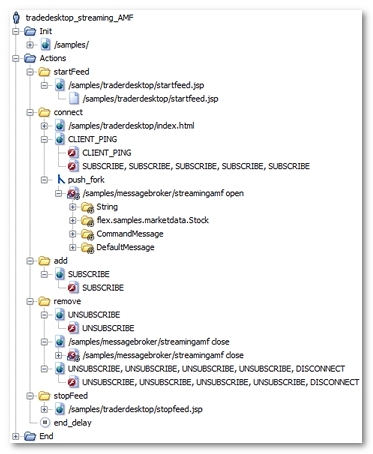 These different objects are modelized by the Push messages (flex.samples.marketdata.Stock or String for example). The close Push request (/samples/messagebroker/streamingamf close for example) tells the server to stop Push. Upon receiving the request, the server closes the streaming request /samples/messagebroker/streamingamf open, allowing NeoLoad to move on to the next action. There are no other actions in the push_fork object so the secondary thread ends.